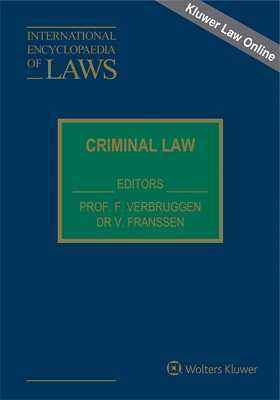 The national monographs in this subset of the International Encyclopaedia of Laws provide a general insight into criminal law and procedure in different countries. For each country, an introduction presents the requisite background knowledge for understanding the principles of criminal justice, and then proceeds to a detailed examination of substantive criminal law – its general principles, the principles of criminal responsibility or liability, and the grounds for the justification of criminal offences. A third part is focused upon criminal procedure in each country: the general characteristics of the procedure, the organization of investigation, pre-trial proceedings, trial stage and appeals. A final part covers the execution and extinction of the sanctions. Forthcoming international monographs will relate to the European Convention on Human Rights, the jurisprudence of the European Court and the European Commission of Human Rights, the mutual assistance treaties in criminal matters, and the criminal law aspects of the European Union.